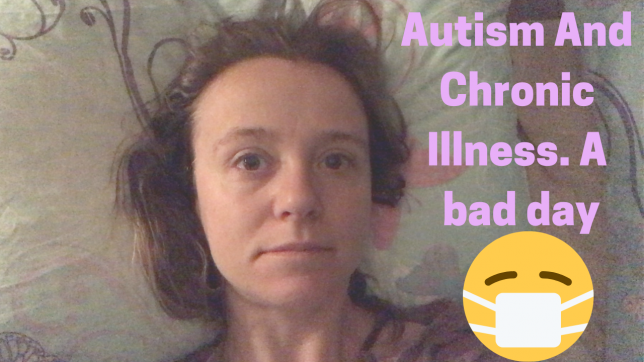 It can be very difficult using the internet to spread awareness, and understanding of autism and chronic illness when you have autism and a chronic illness. I feel that I need to be as positive as possible to encourage others and try to live my best life. However if it wasn’t a struggle, it wouldn’t be a thing. Recently I’ve had a tough time, we lost two close families members in the last few months. The stress of this caused me to return to smoking again, which only makes things worse. This day was a tough day, but I got through it and will keep ploughing through until I’ve found a way to live which serves me well. I hope you enjoy my video, and find a way to get through your tough days. My dearest Ella. Thanks so much for sharing this to the world. Very brave of you. I hope you’ll feel good soon. Sending you waves of good vibes. The first 2 or 3 days around the period are so draining for me as well. Everything hurts. Everything is pulled by gravity, including moods. I am trying the moontime approach (slowing down during those days, and really not doing much). In my case it helped a lot. Maybe it would work for you, too, to ease up a bit. Previous story Disabled Victims Or Heroes?